So. It’s a whole new year. In reality it’s Tuesday. It’s really just a Tuesday, but the telly line up looks different as Holby City isn’t on, and the BBC seem to think we all need to brush up our Mockney so have put Mary Poppins on. And a lot of people have been out running this morning, I saw them. Not going so fast, and a bit stop/starty in nature, but they did it. I’m cynical many will keep it up but seeing as I have done zero exercise I’m about 10 days I applaud them. But it’s Tuesday, and I’m thinking of it like that. So I mentioned before in my last post that I will, in 2013, open my door to new opportunities, new challenges. Career wise, socially, vocationally, I’m going to take whatever opportunities really engage me. This year gone by, I must admit, has not been an optimum year for me to spread my wings in this sort of way, but this year I will make it my business to be more open. I don’t believe in the resolution business on January 1st. It’s just temporary motivation, which lets face it plagues us all, all year long. Instead I’m using the lessons of 2012 and the hopes I have to really motivate me for the year ahead. That feeling of treading water that has plagued the last year is my biggest motivator. I fear that continuing. The idea that in 5,10, 15 years time I feel the same is like a cold bucket of water to me. I want to inject a bit more discomfort in my life whilst I’m still young enough to respond. The slippers, the weekends in the kitchen, all this Radio 2, I love it but its all too easy, and right now I think I’ve been hiding behind it too much. I need the challenge. As I find myself rubbing my hands thinking “come on life, do our worst”, I have been looking all over twitter and the Internet to find out e best way to monitor this, and to give myself nuggets of enthusiasm and encouragement. I think the best way is to just be resilient and chipper. But I, not a chipper type. I’m the exact opposite I think, I’m a bit of a cynical wise arse. So to prevent this, I rather liked a suggestion I saw Jo Wheatley put forward. You write a memory or a happy thought or a positive thing that had occurred down and pop it in the jam jar, ready for next new year, to remember the good of the year next New Years. So I’m going to try (no false proclamations, it will be an attempt) to sign off each blog post with a positive, happy thought to remember this fine new year of ours. I have entitled it the “virtual jam jar of fabulousness”, and would open this up to other bloggers to follow. Lets fill it with pics, quips, memories and thoughts, so no matter what crap falls beneath our feet, we can open the jar to something decidedly more happy. Number 1 in my jar? My family. Pete and Daphne. Pete swooped in on Christmas Day and took me home, to make sure I was asleep in my own bed that night, no matter now uncomfortable I felt that I was at least in my own bed. And Daphne never left my side, more clingy than usual, whilst I was ill. Exactly the codependency I was after. Today we took her for a walk in the park, a cold, sunny, wrapped-up stroll before dinner. This goes straight in the jar. Perfect leisurely stroll, walking off a big lunch of pulled pork sandwiches followed by Anna Olson’s fudge brownie. 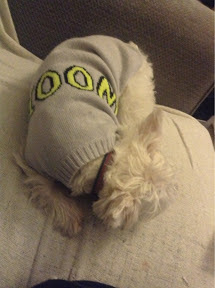 Have I shown you her new sweater from Whistles. So cute. So there’ve go: day 1 and the jar has Pete, Daphne, pulled pork sarnies and Anna Olson’s salted pecan brownies in it. I’m sold. Oh, I forgot to say: Happy New Year to you too. Here’s to a fabulous year.